Our ship made its approach into the Panama Canal just before dawn. Since cruise ships have priority for passage, several dozen freighters lay at anchor in the bay, waiting their turn. In the misty grey of early morning, all those ships on the near horizon resembled an old movie scene of an invasion fleet during war time. As we entered the channel for the first lock, a hanging roadway could be seen several feet above the water line and running across the face of the lock. It was one-way vehicle traffic until a signal sounded and traffic could then go the other direction. When our ship moved further into the the channel, guards closed traffic gates on both banks and all vehicles were stopped. The hanging roadway parted in the middle and each section rotated to the side, allowing room for our ship to pass. Eight "mules," resembling small train engines on railroad tracks, attached cables to the ship to help guide her through the narrow locks. (Some very large freighters left grey paint smears along the walls of the locks.) There were four "mules" to a side, two forward and two aft. When we had transited all three locks on the Caribbean side, the cables were released from the ship and reeled in by the "mules." Then the little engines were off to assist the next ship. Off to the right, we observed a narrow waterway, the site of the French attempt to build the canal before the Americans took over. Unfortunately for the French, they were used to digging in sand like they did for the Suez Canal, whereas the Panama Canal turned out to be a process of blasting in hard rock. To the left is the construction for another set of locks being built for much wider ships to transit the shortcut from the Atlantic to the Pacific. These locks are set to open in 2015 or 2016. 1~ The earliest mention of a canal across the Isthmus of Panama dates back to 1534, when the King of Spain ordered a survey for a route through the Americas that would ease the voyage for ships traveling between Spain and Peru. This route would provide the Spanish with a military advantage over the Portuguese. In a 1788-93 expedition, Alessandro Malaspina outlined plans for the canal's construction. 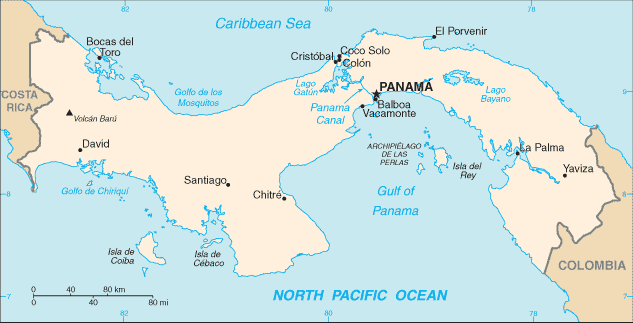 2~ Backed by the U.S., Panama seceded from Colombia in 1903, which allowed the canal to be built by the U.S. Army Corps of Engineers between 1904 and 1914. 3~ President Jimmy Carter signed a treaty in 1977 giving the canal back to the Panamanians. They took complete control in 1999, however the U.S. reserved the right to defend the canal. 4~ Passenger vessels in excess of 30K tons, also known as cruise ships, pay a passage rate based on the number of passengers that can be accommodated in permanent beds. This charge is currently $92 per unoccupied berths and &115 per occupied berth. Freighters have different rates. Our ship paid well over two hundred thousand dollars to enter Gatun Lake through the three locks and go back out the same day. 5~ The lowest toll paid was 36 cents by American Richard Halliburton who swam the Panama Canal in 1928. Wonder if he was aware of crocodiles living in canal waters? We saw one taking his own swim for free. 6~ John Le Carre wrote The Tailor of Panama, a spy thriller novel which was later made into a movie. Parts of the movie were filmed in Panama to include the canal and Gatun Lake. There were several scheduled land tours, but we elected to stay on board and watch the operation of the locks and the "mules." After the ship had passed out of Gatun Lake, back through the locks and into the bay, she docked at Colon for a few hours in order to pick up passengers who had gone land tours. We picked this time to go ashore and take in the locals. Shopping wasn't much, but we did enjoy some Panama beers at an open sidewalk bar called the Lucky Seven with its very friendly owner. Once again, we found, too late, that the bar had wi-fi. Time was, back in the '80's, you could buy a cargo plane in Spain, register it in Panama, fly to a clandestine airstrip guarded by the Colombian army in the Colombian jungle, load up your contraband, get airborne after midnight, fly across the Gulf, enter U.S. airspace, pass over the SAC base in Omaha without being noticed and land in a wheat stubble field along the Missouri River about the crack of dawn to unload your cargo. If you were lucky, the law didn't catch you on the ground. One plane in particular wasn't lucky. We took the load, crew and ground crew. On December 1989, the U.S. invaded Panama. Its dictator, Manuel Noriega, was subsequently taken as a prisoner of war. He was flown to Miami and tried on eight counts of drug trafficking, racketeering and money laundering. His forty year sentence was later reduced to seventeen years based on good behavior and he was extradited to France in April 2010 on a money laundering conviction. In December 2011, he was extradited back to Panama for murder and human rights abuses where he had been sentenced in absentia for a term of twenty years. Guess it's good to be the dictator, unless you screw up and the U.S. comes knocking on your door. Would I go back to see Panama? You bet. We are already thinking about a Panama Canal cruise in 2016 when the new set of locks is open to wider ships. See you in two weeks in Limon, Costa Rica. Interesting post! A canal passage was on our bucket list and we finally did it back in 2011. We were on board the Star Clipper, a tall ship. They had to time the beginning of the trip to the minute since the top mast of the ship only clears the bridge over the canal at Panama City by about a foot and a half. Even at that they had to climb the mast and lower the radar in order to make the passage. Dale, I think I know what bridge you're talking about. It was BIG! Dale, sounds like a fun trip. Dix, hey bro, thanks for being there at that time. It can be a crazy world in some places.